What's big, red, and supposed to be the next big thing in workplace collaboration? 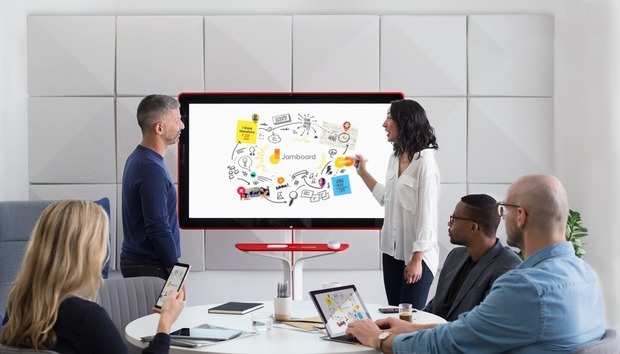 Google's new Jamboard, a massive touch display and accompanying cloud service that's supposed to help business users brainstorm together. For companies that have already invested in using G Suite and want to spend tens of thousands of dollars on bringing digital whiteboards into their workplaces, Jamboard seems like an interesting option. The hardware is slickly-designed, and Google's functionality feels like it could be a major enhancement over analog brainstorming. But Google is asking companies to make a big commitment to Jamboard. The company isn't revealing final pricing for the appliance yet, but expects its hardware to cost less than US$6,000 at release. That means a rollout of multiple Jamboards in an organization will likely cost tens if not hundreds of thousands of dollars. In many ways, Jamboard feels like a quintessential Google product -- slickly designed with features that are futuristic and forward-thinking, and forged in the crucible of the company's own rigorous needs. But like the company's other offerings in that vein, there's still an open question about whether its customers are interested in or ready for the future.